It’s a night Daniela Galindo and Seward fans will always remember. The sophomore from Shattuck shattered two revered single game school records Saturday night. Galindo broke the record for points in a game with 50 and three pointers with 10 in a 126-36 win over College of the Southwest JV Saturday night in the Green House as part of the Pizza Hut Classic. Galindo shattered Rachel Barnes record of 41 in a game against Cowley in the Region 6 Tournament in 2010. 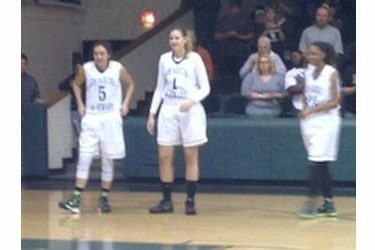 Stephanie Rhoten and Stephanie Thiel had both made eight three pointers in a game. Seward led 68-19 at the half and forced 46 turnovers. They led points off turnovers 71-9. Axelle Bernard had 12 points and 12 rebounds. Erin Richardson had 11 and Joanna Grymek had 10. Seward is 4-0 and plays at Midland against Odessa Friday and Midland Saturday at 5 both nights on 1270 and kscbnews.net.